Made by Goss, Bronwyn in Perth, Western Australia, Australia, 1988. Belt pouch, brass, gilding metal, 24 carat fire-gilding with patina, Bronwyn Goss, Perth, Western Australia, 1988. Chain mail belt pouch of brass and gilding metal, 24 carat gold fire gilding and patina. Conical form, suspended from a thick gilded ring (uneven diameter, approximately 50mm), and attached to a belt hook. Front of the pouch profusely decorated with short lengths of wire with 'knobbed' ends, which have been twisted and woven into the links. The uppermost wires show traces of gilding; the whole object dark brown/black patinated. 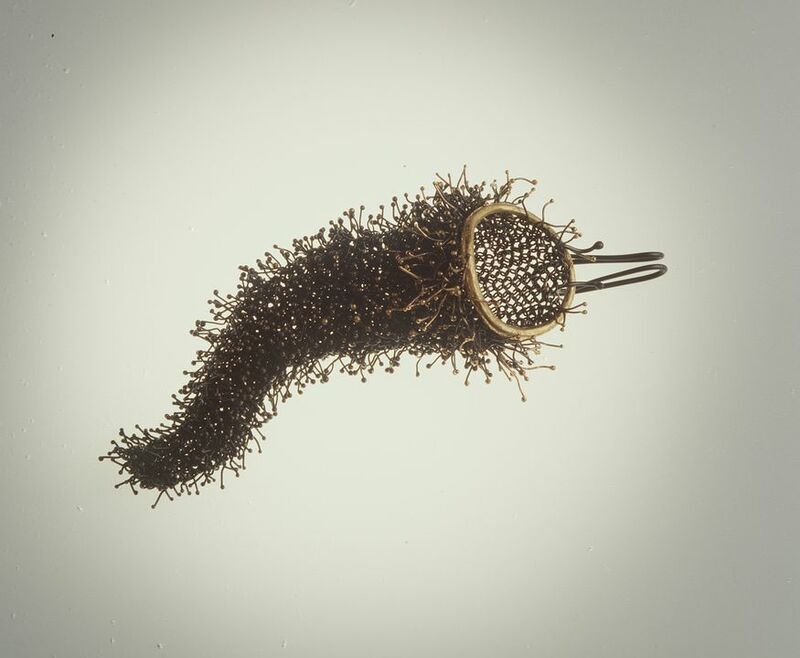 Exhibited in 1988 at the Contemporary Jewellery Gallery, Sydney.